We woke up in 2016 stoked with the news that we’ve been awarded the top Hygiene and Food Safety rating by the Warringah Council and the NSW Food Authority’s Scores on Doors program. 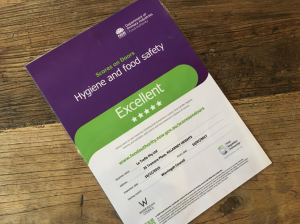 What’s great about the Scores on Doors rating system is that it’s no longer up to restaurants to go out on a limb claiming how clean and tidy they are; local councils and the NSW Food Authority do that instead. The score is determined following a standardised Food Premises Assessment, which levels the playing field for everyone, and allow customers to make informed choices. So thanks to our hardworking staff – particularly Roxy and Fernando – for understanding how important that is and for walking the extra mile to make it happen. All the love and care that you put in your work has paid off. Thanks too to our customers and friends for understanding and appreciating the effort that goes into making food that not only tastes great but that is also clean, safe and healthy.